The Dinges family says they would not be sharing video of their dog Boozer being attacked by a coyote if he wasn't recovering so well--but they thought it was important to warn others how quickly things can happen. Trina Orlando. An Illinois family is issuing a warning to other pet owners after their dog was attacked by a coyote in their backyard. 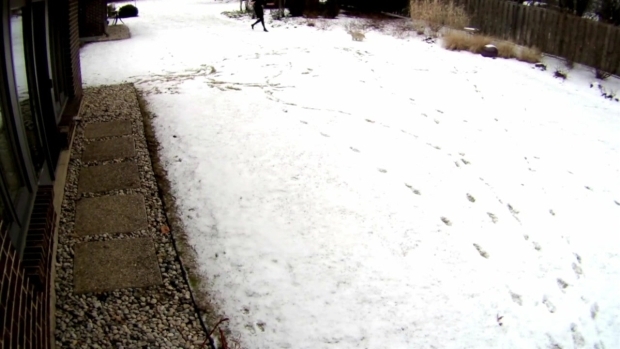 Surveillance video captured the moment a stray coyote charged at Boozer, the Dinges family's cairn terrier, just steps from their back door in Northfield. The Dinges family says they would not be sharing video of their dog Boozer being attacked by a coyote if he wasn't recovering so well--but they thought it was important to warn others how quickly things can happen. "My wife and I were actually on the phone and literally within seconds a coyote that had been in our backyard, but we hadn't seen, pounced on Boozer," Barnaby Dinges said in a phone interview. Video shows the coyote clamping down on the dog's head and dragging it around the backyard. Dinges said his wife rushed outside and scared the coyote away. The encounter lasted just seconds, but it was long enough for Boozer to suffer substantial injuries. "He's got a major gash on his head that had to be stapled closed," Barnaby said, listing numerous other gruesome injuries. Boozer has been a beloved member of Dinges family for 14 years — and they never thought this would happen. "You look at that video and he is flat-footed in his backyard and minding his business and a very aggressive coyote came out of nowhere," Barnaby said. After the attack, village officials warned residents in a Facebook post of the uptick in coyote sightings in the winter months and provided safety tips. The Illinois Department of Natural Resources estimates there are more than 30,000 coyotes in the state. "These coyotes are hungry, aggressive and they're looking for older animals that they can prey upon," Barnaby warned. Dinges noted these coyotes are "hungry, aggressive' and looking for older animals to prey on. He is warning other families to be careful. "These coyotes are getting more and more comfortable," Dinges added. "[They're] beautiful to look at, but can do tremendous damage in about five seconds." The University of Illinois Extension recommends not leaving small pets unattended outdoors and installing tall fences in areas particularly prone to coyotes.